The chocolate chip carpet bugle is a dwarf, spreading plant with a tight, chocolate brown foliage that looks like a mat. It grows to a maximum height of 3 inches, but slowly spreads to 24-36 inches wide. The foliage of the bulgeweed as it is also known as, has dark green undertones and beautifully contrasting blue flowers that rise above it. It blooms in the spring to early summer but may repeat bloom in mild, more conducive climates. Maintaining this plant is fairly easy. When planting, ideal ajuga chocolate chip spacing is 2-2.5 feet apart to give them ample space to spread. It grows best in moist and well drained soils and will need regular watering during the first growing season so that it establishes an extensive root system. After this, you can water as needed. 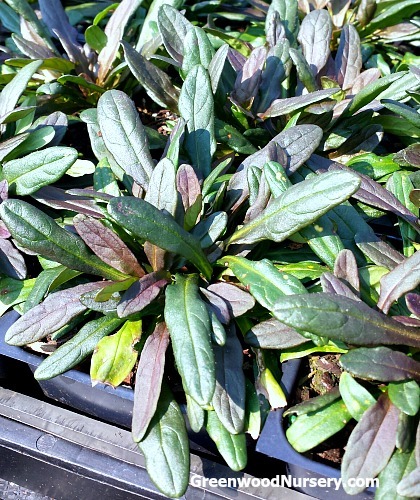 Grow it in partial to full sun for the best foliage color. Images above taken in late September. Orders shipping to AZ and CA may be bare rooted for shipping.